Summer is finally making its appearance in Chicago, and I’m welcoming it with open arms and a rumbling stomach as I think about all the picnics, barbecues, and camping trips that are right around the corner! Because I love these summer occasions so much, I’ve always got my eye out for new, easy recipes to liven them up. And really, the possibilities are endless! Pinterest alone has thousands upon thousands of amazing salad recipes – sweet, crunchy, savory, citrusy…just to mention a few. I found this salad via Pinterest on Greenlitebites.com. Every May Evan and I host a birthday/Mother’s Day barbecue for his mother, Lucy, at her home in New Hampshire. In the past I’ve made some variation or other of pasta salad to serve alongside our BBQ feast of chicken, steak, and hot dogs. This year, I wanted to change things up a bit. 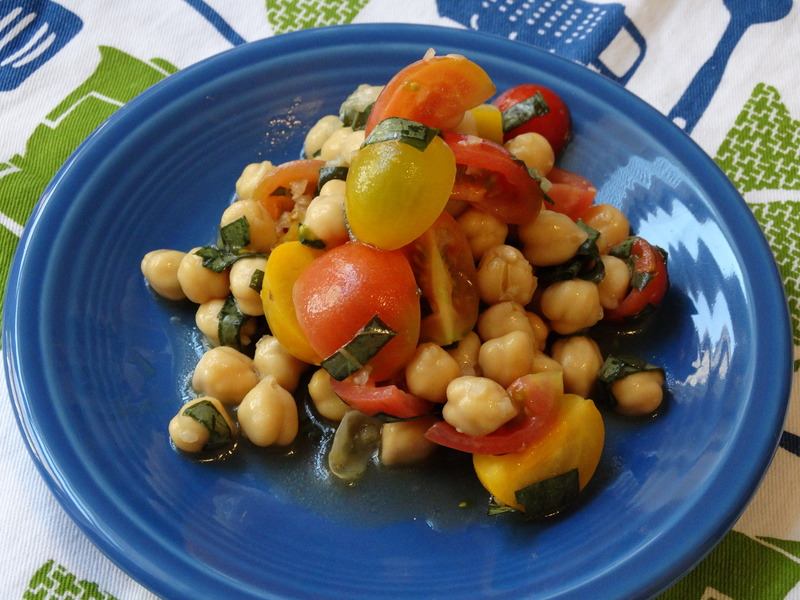 After I scoured my Salad board on Pinterest for inspiration, I decided on this simple salad. There aren’t too many ingredients required for this recipe; I had more than half of them at home already. It doesn’t take much time to put this all together, which is great if you are in a rush or running late to a picnic. 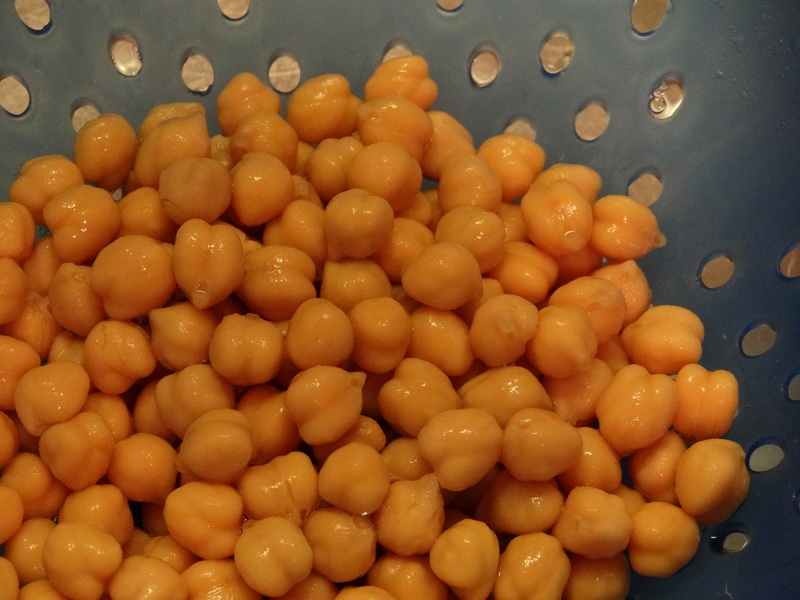 Start by draining and rinsing 1 14-ounce can of chick peas (also called garbanzo beans). Add them to a medium mixing bowl. 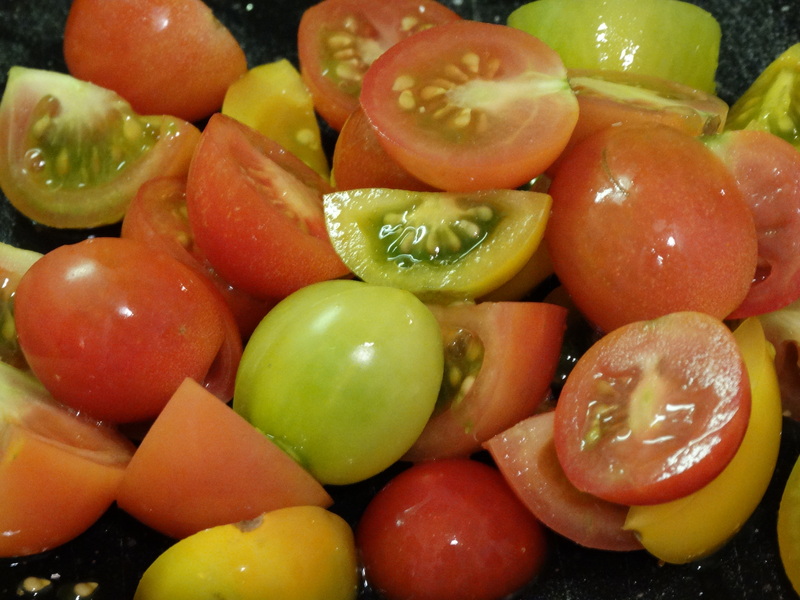 Next, wash and slice a pint of grape or cherry tomatoes. I used heirloom tomatoes to add a variety of colors to my salad. 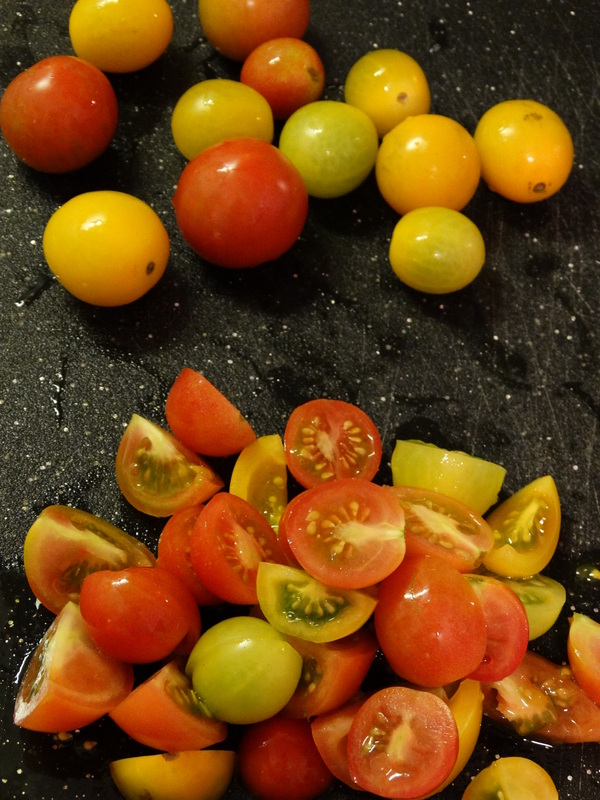 Slice the smaller tomatoes in half. Some of mine were a little on the plump side, so I quartered those. Add them to your mixing bowl. I could sprinkle these with some kosher salt and eat them just like that! 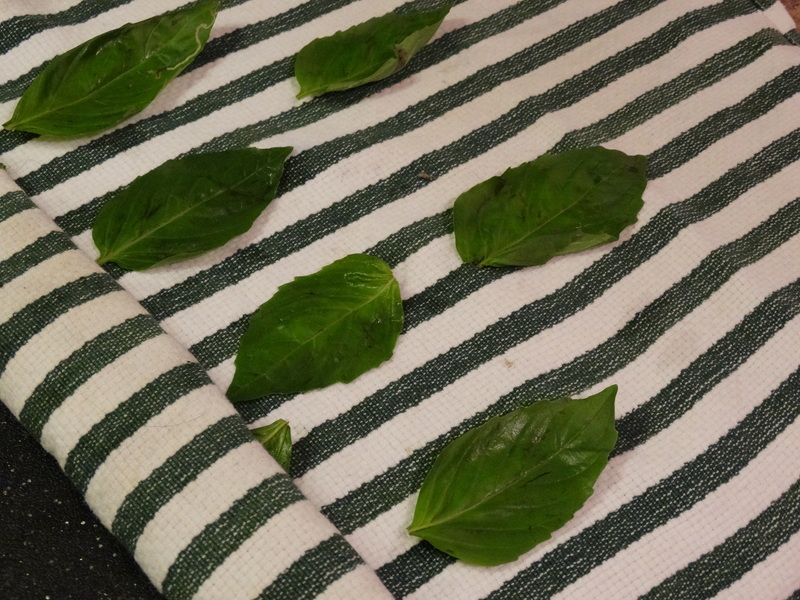 Then, put the basil leaves in a single stack and slice them thinly. Depending on how long the strips are, you may want to cut them in half to make twice as many shorter strips. When you are through, throw them in the bowl. 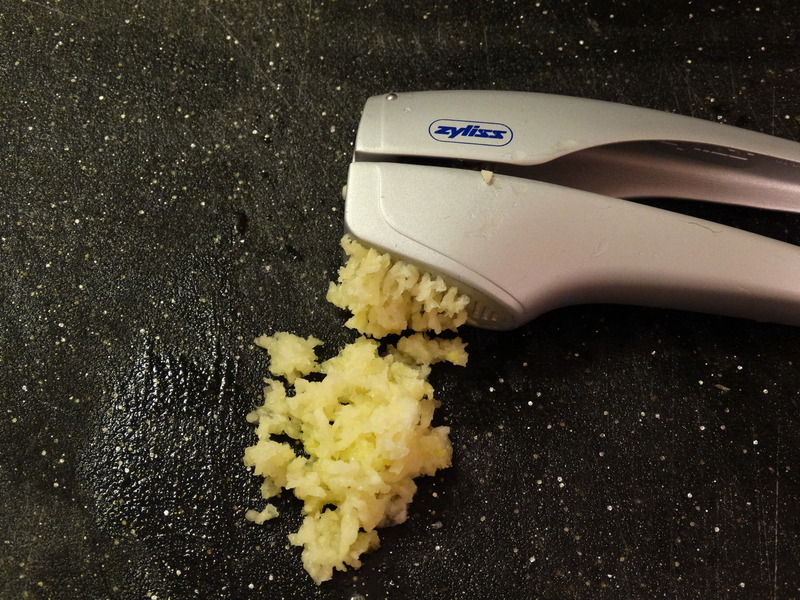 Peel and press 3 – 5 cloves of garlic and add them to the salad. 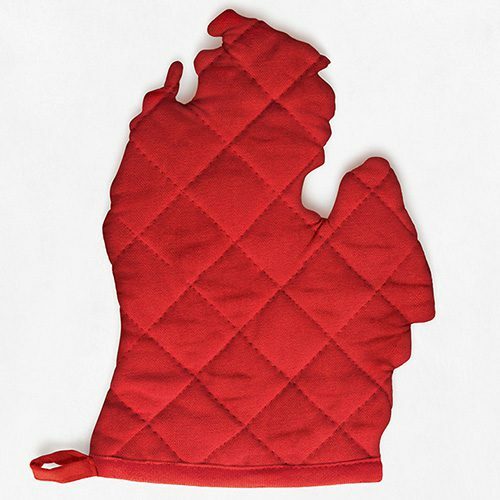 You can mince them if you don’t have a press. The more garlic you use, the more zing this salad will have, so if you don’t care much for raw garlic, you may want to go easy on it. All that’s left now is the dressing. In a small bowl, whisk together 1 tablespoon red wine vinegar, 1 tablespoon apple cider vinegar, 2 teaspoons olive oil, 1/2 tablespoon honey, and a pinch of kosher salt. Add the dressing to your salad. 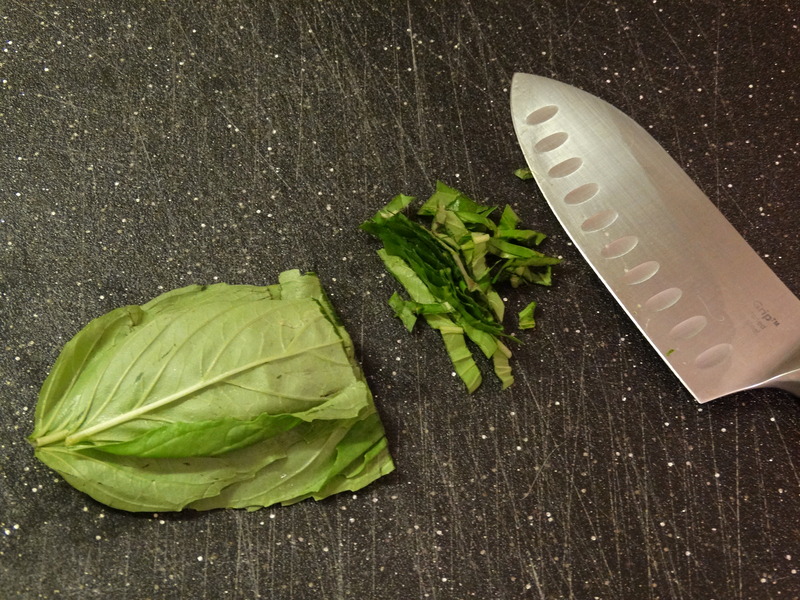 Stir using a large wooden spoon until the entire salad is evenly coated. Cover and let marinate for at least 20 minutes before serving. Viola! 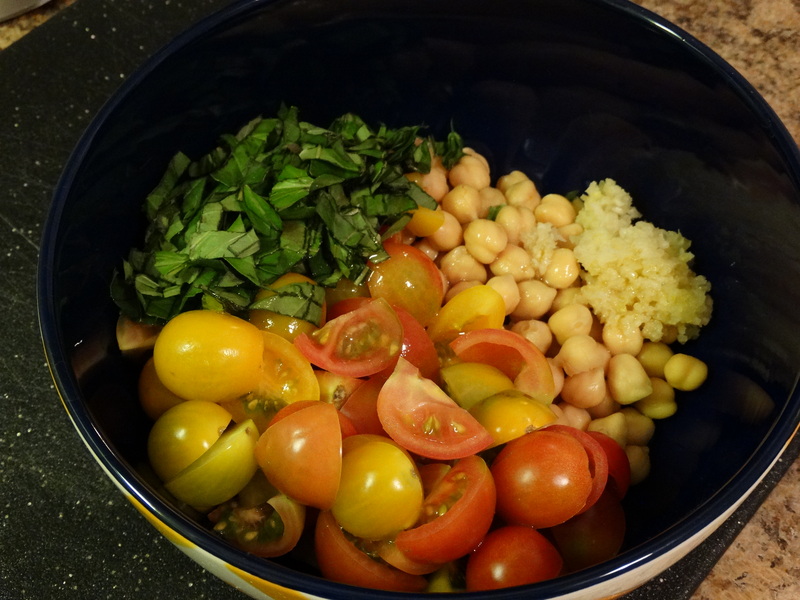 1) Add the chickpeas, tomatoes, basil leaves and garlic to a medium mixing bowl. 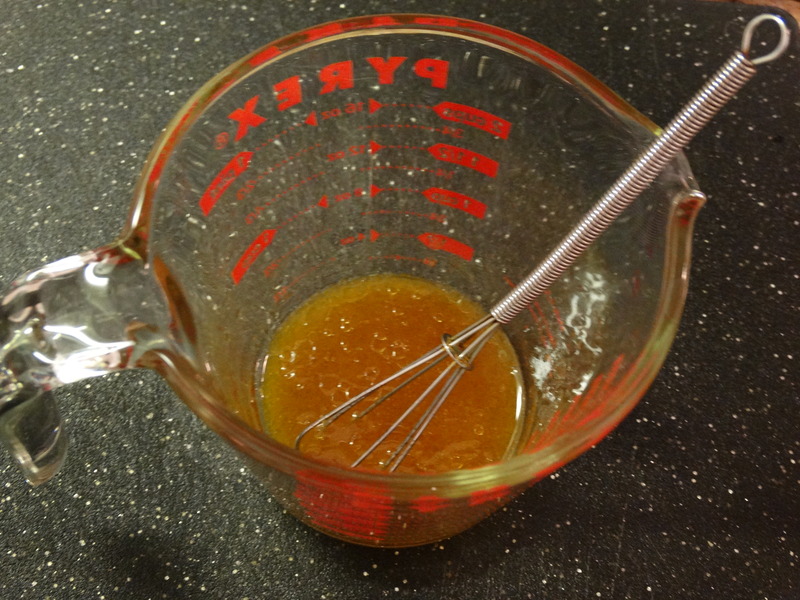 2) Whisk together 1 tablespoon red wine vinegar, 1 tablespoon apple cider vinegar, 2 teaspoons olive oil, 1/2 tablespoon honey, and a pinch of salt. 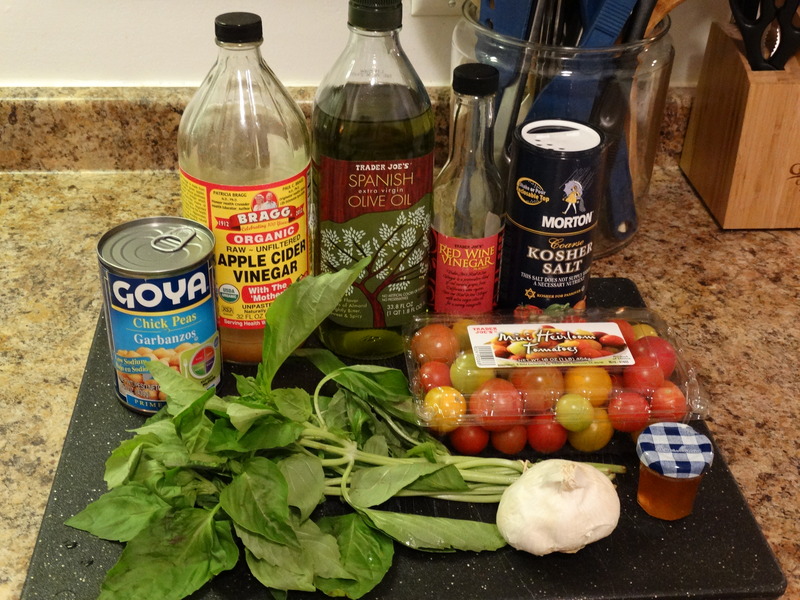 Add it to the mixing bowl and use a wood spoon to coat the salad evenly. 3) Let sit for at least 20 minutes before serving. Enjoy! Yum that looks so fresh!